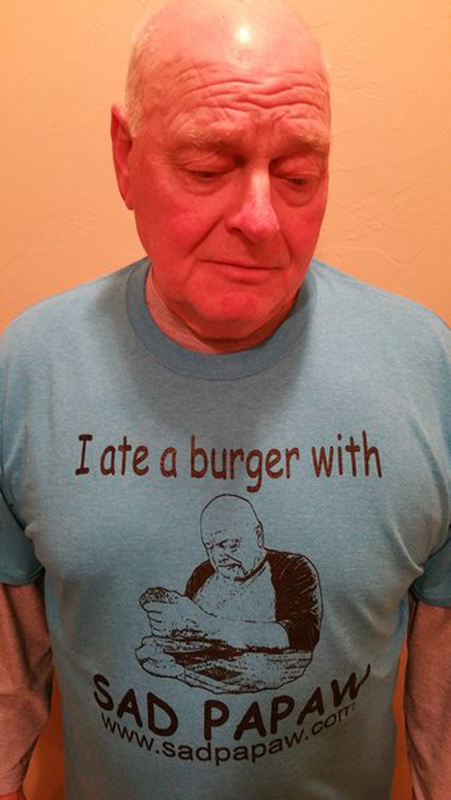 It's time to bring a smile to Papaw's face—and cop a "I had a burger with Papaw" t-shirt for a cool $25. Papaw, everyone’s favorite internet grandpa, is having a huge cookout in Oklahoma later this month—and you’re invited. Papaw, a.k.a Kenneth Harmon, first came to the internet’s attention when his granddaughter Kelsey Harmon tweeted out a picture of her grandpa looking extra sad while holding a burger. Harmon had apparently made 12 burgers for his six grandkids, but Kelsey was the only one who was able to show up, writes BuzzFeed. Within 24 hours, Kelsey’s tweet was retweeted over 70,000 times and spurred plenty of hilarious responses—though some of the absent cousins were sent death threats. Still, Harmon, like a true, adorable grandfather, decided to do something for all of his newfound internet grandchildren. He had his grandson tweet out a note about a barbecue he’s hosting at a flea market in Oklahoma owned by the family this Saturday. There, Harmon will sell $2 burgers to anyone who wants to eat one with Papaw. And to further capitalize on his viral fame, Harmon will be selling “I had a burger with Papaw” shirts for a cool $25 each. While some news outlets have reported the money will be donated to charity or be set aside for his grandchildrens’ college funds, all of the money is going to Papaw. “What he decides to do with them is his business,” notes his grandson Brock. Brock has no idea about how many people might actually show up, but people from around the country have been “contacting him to tell him that they are coming.” Hopefully the cookout will be a much greater success than the potato salad party thrown by the guy who raised money on Kickstarter to learn how to make the spuds-based side dish.